Waterbird Count 11/6-11/10, plus season totals. There was a pretty decent selection of birds for the last week of the count. http://atlasglassmirror.com/three-columns buy cheap brand viagra online Redpolls have been around the area frequently, there have still been a few grebes to count, and the recent duck species are definitely more of the “winter duck” species. A Great Black-backed Gull was seen on the 8th. Some noteworthy numbers include 120 Bufflehead on the 9th, and 777 Long-tailed Ducks on the 10th. In the Fall of 2018, 29,034 waterbirds were counted, 17,632 of them being ducks/geese. It is likely that many of the cormorants and gulls that contributed to the count were counted more than once, so in reality the waterbird total would be smaller. Also of note was a total of 682 Monarch Butterflies that were seen migrating south from McGulpin Point. Although this was a below average season, it was definitely an interesting fall. I wonder what waterbirds will pass the straits next season! This entry was posted in 2018, Waterbird Count 2018, Waterbirds on November 20, 2018 by Kyle Wiktor. There still have been a few decent days for Long-tailed Duck movement, the 3rd in particular had a total of 205 of them. There has now been an increase in the number of Bufflehead on the move; 98 of them were counted on the 4th. In the past few days Horned and Red-necked Grebes have been resting on the water and can often be pretty close and easy to see. 1 Greater Yellowlegs flew by to the east today, it is getting kind of late in the season for this species to still be around. Just about every day lately, Snow Buntings are seen from McGulpin Point, on the 1st a nice flock of 37 landed very close to me on the beach. Here are the recent lists via eBird. This entry was posted in 2018, Waterbird Count 2018, Waterbirds on November 5, 2018 by Kyle Wiktor. The Long-tailed Ducks are still migrating through the area. On the 27th there was another impressive day total of 1,178! Only 6 were counted on the 29th, 57 on the 30th, and 157 on the 31st. After kind of a low period, species diversity went back up today. Today 8 Greater Scaup, 1 Black & 22 White-winged Scoters, 4 Common Goldeneye, 47 Red-breasted Mergansers, a Common Loon, 2 Horned & 6 Red-necked Grebes and an adult Great Black-backed Gull were counted; a pretty good mix compared to earlier this week. 96 Sandhill Cranes were counted on the 27th & 89 on the 29th. Also seen today was this local pair of Bald Eagles, one of which is carrying what appears to be the remains of a dead duck that was floating out in the straits. Passerines: Snow Buntings are seen almost daily at McGulpin Point. On the 29th, the first Common Redpoll of the season landed on the beach. On the 30th there was a pretty good morning flight of finches, which included (probably many more than): 7 House Finches, 1 Purple Finch, 10 Common Redpolls, 1 Pine Siskin, & 122 American Goldfinches. This entry was posted in 2018, Waterbird Count 2018, Waterbirds on October 31, 2018 by Kyle Wiktor. The past two days have been rather slow. This is however an interesting time of year when even on the unfavorable days Long-tailed Ducks and Rough-legged Hawks are found daily. 30 Long-tailed Ducks were counted yesterday and 91 today. Whenever these birds think conditions are more to their liking again (probably any day now) there could likely be another day with a count of LTDU’s that resembles the 21st, and hopefully good numbers of other species too! This entry was posted in 2018, Waterbird Count 2018, Waterbirds on October 26, 2018 by Kyle Wiktor. Recent sightings at the Waterbird Count. In the past week, the main highlight would have to be the Long-tailed Ducks. On the 20th, 172 were counted. On the 21st, an amazing flight of 1,833 were counted. 18 of them flew east and all the rest were flying west. In just the 3rd counting hour alone, 845 flew by. It really was incredible to see single flocks of 100+ LTDU’s many times over. Hopefully there will be another day or few that are similar to this during this fall season. Several White-winged and a few Black Scoters have been added in the past few weeks too, as well as a decent number of Redheads. 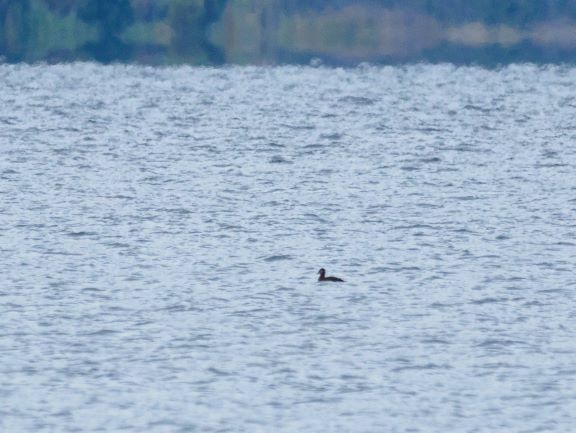 Also on the 20th there was 1 Red-throated & 3 Common Loons that flew by. Despite the wind appearing to be very favorable for migration today, it was a very inactive day for waterbird migration at McGulpin point compared to most of the days this week. Likely the highlight today was a total of 3 Snow Buntings. Another close up passerine was this White-breasted Nuthatch. It’s nice to have some little birds keeping you company. This entry was posted in 2018, Waterbird Count 2018, Waterbirds on October 24, 2018 by Kyle Wiktor. Numbers of ducks especially Scoters and Mergansers are on the rise. Today in particular with the strong northwest wind, 1040 ducks were counted. Of those, 418 were Red-breasted Mergansers, 97 Redhead, 106 White-winged Scoters, 1 for sure Black Scoter, & 39 Surf/Black Scoters. Other recent highlights include a Bonaparte’s Gull on 10/11, a Long-tailed Duck on 10/12, an American Black Duck on the 12th & 16th, and a flock of 19 Northern Pintail on the 16th. Today & yesterday there was a Red-necked Grebe that just sat on the water all day within fairly close distance to the beach. Northern Harriers have been crossing the strait more frequently in the past week, 5 were counted today. A noteworthy passerine observation was a Snow Bunting that flew across the strait today. Based on the current weather predictions, Saturday and Sunday look like they will probably be the best days for birds on the move for the rest of this week. This entry was posted in 2018, Waterbird Count 2018, Waterbirds on October 17, 2018 by Kyle Wiktor. Update on the waterbird count. As we have now entered October some species have become more common now and others seem to have tapered off. 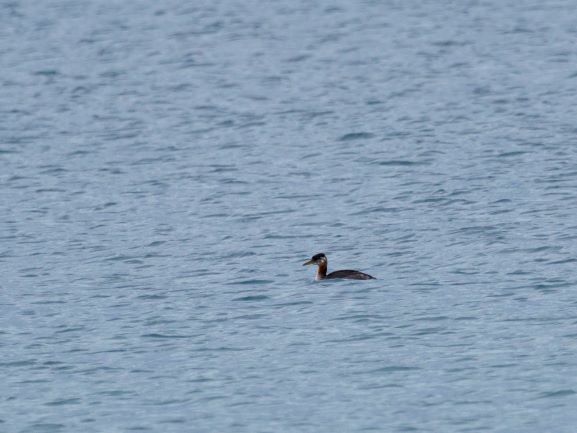 White-winged Scoters are now found almost daily and Horned Grebes are now pretty regular. Scaup numbers have also gone up recently. As far as passerines go, American Pipits now roam the beach daily and will often come in close for great looks. October 2nd was the best raptor day of the season from the McGulpin side with over 700 individual raptors counted including a light morph Rough-legged Hawk. On the same day the Sandhill Crane total was 1005 from McGulpin. Turkey Vultures in flight in late September. One of several American Pipits that have been seen lately. Complete eBird lists are below. 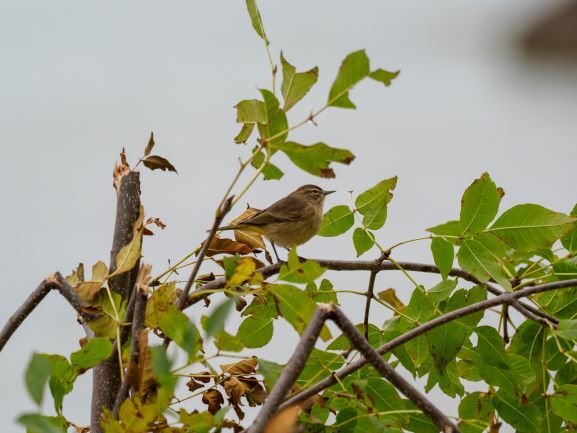 This entry was posted in 2018, Waterbird Count 2018, Waterbirds on October 10, 2018 by Kyle Wiktor. I filled in for Kyle last Sunday, but due to some website issues, I have not been able to type up this report until now. It was an interesting day. The weather was very dull and dreary and rainy in the morning, as will be evident in the photographs. The rain died down after a few hours, but the clouds never let up. For much of the day, the front edge of a front was traveling through the straits parallel to it. 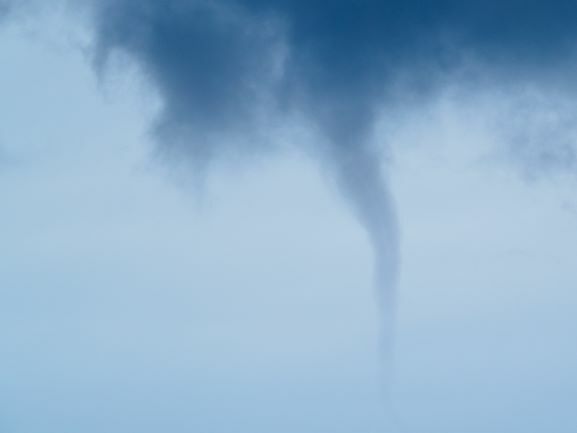 Around 2PM it produced this between McGulpin Point and St. Helena Island. It only lasted for about thirty second and then quickly dissolved, but was still pretty interesting. Birdwise, the day was generally marked with slow periods punctuated with a few minutes of activity. Overall, it was a good day for diversity. Highlights include an early morning Pine Siskin that I heard fly in off the lake. I wasn’t able to locate it for a few minutes, but eventually it flew out of the woods and landed in a nearby bush for a few minutes. Red-throated Loons outnumbered Common Loons. This happens from time to time, but is not really a common occurrence. 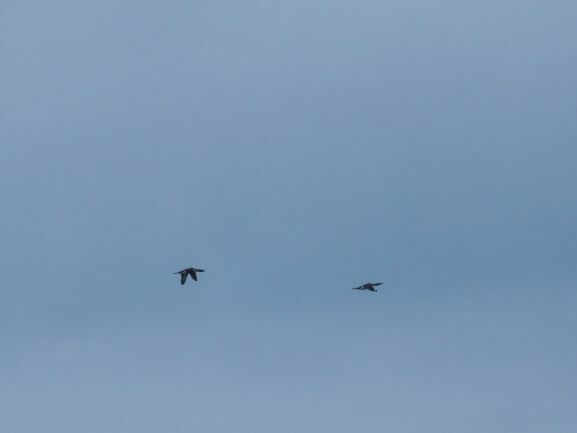 Here is a pair that flew by midday. 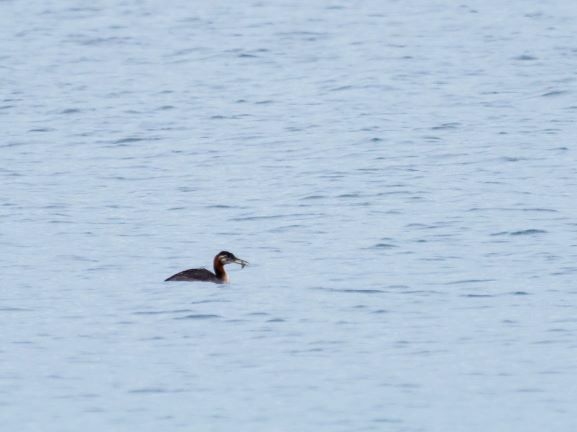 There were a few Horned and a couple of Red-necked Grebes hanging out off the beach for much of the day. There was also a Surf Scoter swimming off of the beach for about twenty minutes. 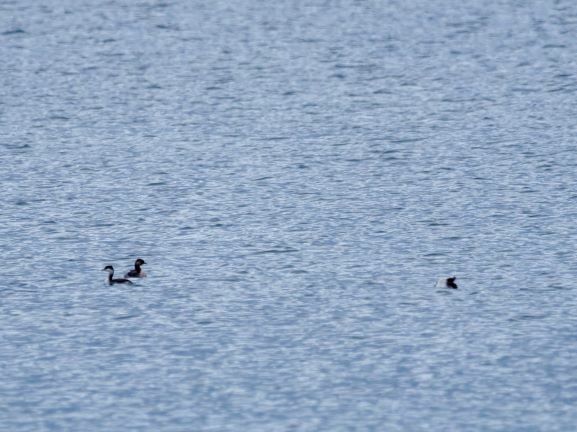 All three species of Scoter were recorded, which is pretty unusual. The highest count of the day was 199 Canada Geese that threw by either south or west. The songbird activity was slow. This was probably partially due to the weather and partially due to the changeover in species composition. Warblers are leaving the area, but soon we should be seeing more Pine Siskins, Snow Buntings, American Pipits, and Horned Larks. I’ll leave you with a photo of a Palm Warbler that was still hanging around. This entry was posted in 2018, Waterbird Count 2018, Waterbirds on October 6, 2018 by Darrell Lawson. The 26th was the best of the last 3 days. Highlights lately include the first Surf Scoter and Lincoln’s Sparrow of the season on the 25th, the highest duck count of the season so far on the 26th, and the first Horned Grebes of the season today. 968 ducks were counted on the 26th, however due to their distance plus the passing rain decreasing light and visibility, only 324 were i.d.’d to species. Of those, 250 were Redhead. Also of note was a Surf Scoter & 9 White-winged Scoters. Total counts can be viewed on the following eBird lists from the 25th, 26th, & 27th. This entry was posted in Waterbird Count 2018 on September 27, 2018 by Kyle Wiktor. In the past 4 days there was a good turn out of terns, a day of decent duck diversity, and a day with winds that made 8 foot tall waves. Some species have been new for the season, and others are becoming more numerous. Nice to see the fall start to increase in action. Morning & evening lists via eBird. This entry was posted in Waterbird Count 2018 on September 24, 2018 by Kyle Wiktor.